Many will agree that Virtual Worlds are wonderful tools when it comes to visualising hard to explain stuff and offer a range of quite useful possibilities. Yet NVE's are still a niche market and have obviously failed as marketing tools. They don't hold the power to overturn the internet yet and become mainstream applications. In my opinion the key lies in integration with mainstream and social networking tools. Virtual Worlds such as Second Life are still mainly social worlds, used for social interaction for certain special interest groups and in this regard they are a mere 3D Chat addition to social networks. In this day and age these social networks are in charger of the internet with Facebook, Myspace etc. holding vast communities. If Virtual Worlds are to stand more than a "snowballs' chance in hell" in this web 2.0 battle for numbers they have to bridge the gap. I think I've mentioned Kaneva in the past as pioneering this with their user profiles with blogging, etworking features etc. to enhance the social power of their virtual world. I've mentioned integration a number of times in the articles here on MindBlizzard and in presentations I did in the past year and a half. 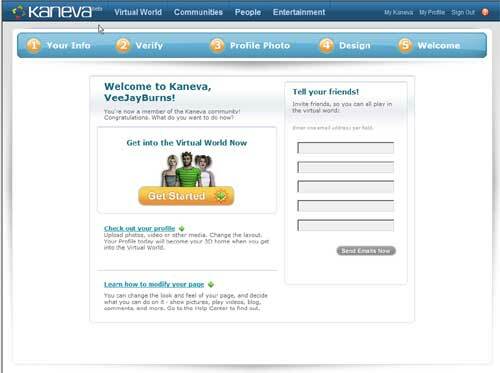 "One of the great features of Kaneva is the personal homepage that you get as a resident - a good start to integrate Web 2.0 and Web 3D into one environment. Think of the power of integrating Second Life with Flickr, Blogger, YouTube, Twitter/pownce and Facebook all in one!" The picture above shows the in the left pane fetched pictures from Stefan’s Facebook photos. As Stefan explains a hybrid web app is talking to the region to change the picture accordingly and pull the photos into frames on the wall (for a more detailed technical explanation see here). There's bound to be more to come on cross platform interfaces and 3D/Web integration. Check out Digado for example with it's accounts on the "Second Life Interface Debate", and here's a vid from Smashing Magazine on "Futuristic Interfaces"
The major concerns the residents of Second Life had in 2007 were probably Scalability and Stability, and these were addressed in the Project Open Letter sometime mid 2007. 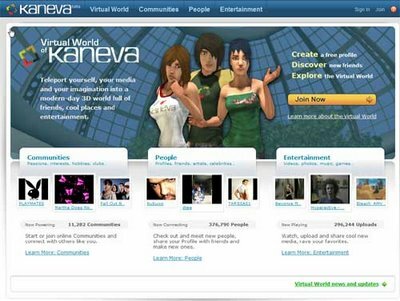 In those days Second Life got laggy when there were more than 30K people online at the same time. A peak concurrency of 61,560 (a new record!) at 1:45PM, and a minimum concurrency of 34,399 at 11:55PM. Median concurrency for the day was 46,627. For comparison purposes, Everquest's record concurrency is reported to have been approximately 90,000 which puts Linden Lab's virtual world more than two thirds of the way there in terms of usage. Scalability, max concurrency are all relative categories though, as each and every world uses its own technique (streaming, download client, java, flash and whatelse there is in variation). Second Life islands can hold 50 to 90 people at the same time, other NVE's can run 8,000 on a single server. It's architecture, infrastructure and all these little things. The bottomline is do we have a good experience when the world we're in is pushing its limits? Some noticed a slight downfall in performance last weekend on Second Life, as they were pushing their max concurrency. Scripting, rezzing etc slowed down a bit. So perhaps it will be July 2008 before Second Life pushes beyond 80 K and year end may see 100K, but I know they're getting there. The new Windlight Client that's available is going to be the best tested client ever and the Linden QA team is trying to get rid of all that resource sucking stuff in there. 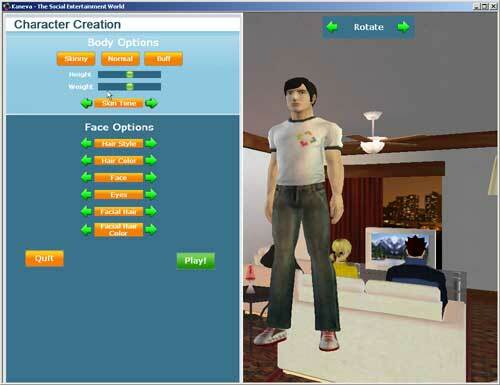 I think 2008 shows promise for Second Life. Triggered by the 3PointD article Conduit Social Gaming World Gets $5.5m Round on another capital venture investment in 3D initiatives I've made a quick survey of 2007 investment news on the aforementioned 3PointD blog and the Metaversed blog. Just coming from these blog is 1.651 Million in investments in the year 2007 to date. Surely, they've missed out on many private investments, startups and corporate investments. 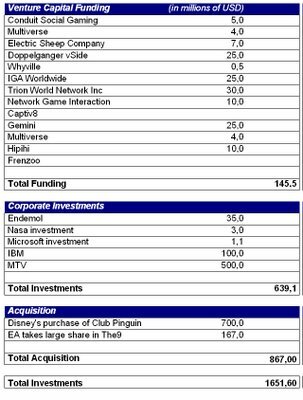 Reports on BBC, MTV and Disney investing in new startups and others virtual startups like Stagespace, Metaversum's Twinity, 3D City (ABKsoft), VastPark (Worlds Collide), Ogoglio, Sony's PS3 Home and Mattel's Barbieworld come without figures. Awomo (a world of my own) is, said to be worth 1 billion euro according to Virgin Records mogul Sir Richard Branson. 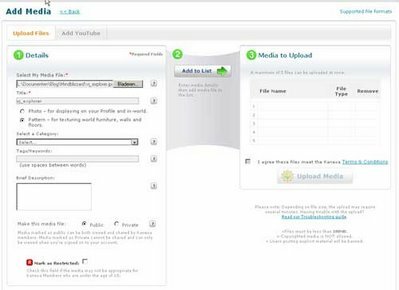 VirtualWorldsNews Interview: HiPiHi Founder and CEO. VirtualWorldNews, the blog supporting the Virtual Worlds Conference and Expo has just released the transcript of their interview with Hui Xu, Founder and CEO of HiPiHi. Read the full interview here. 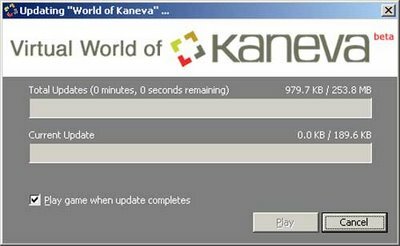 Kaneva and There.com on the offensive. 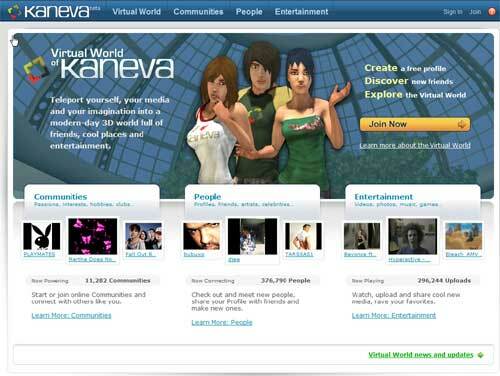 Two virtual worlds focussing on the social aspects of virtual worlds, Kaneva and There.com are stepping up their efforts to grow their population bases. They also report on the article from the New York Times saying that Club Pinguin has been sold for 350 Million USD, with another 350 Million to follow after certain requirements are met. Last but not least the Belgian Second Life Crew reports that where Linden Lab bought Windward Mark to boost graphics, they're outdone by MindArk, producers of the Entropia Universe who incorporated the CryEngine2. Avni Yerli, Crytek’s Managing Director says, “We are thrilled to have been chosen by such a well regarded and successful industry leader as MindArk to be their future engine provider for Entropia Universe. 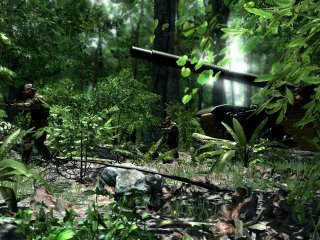 We think the combination of our CryENGINE 2® technology and their extremely popular virtual playground will result in a new kind of rich and immersive experience that has not been possible until now. 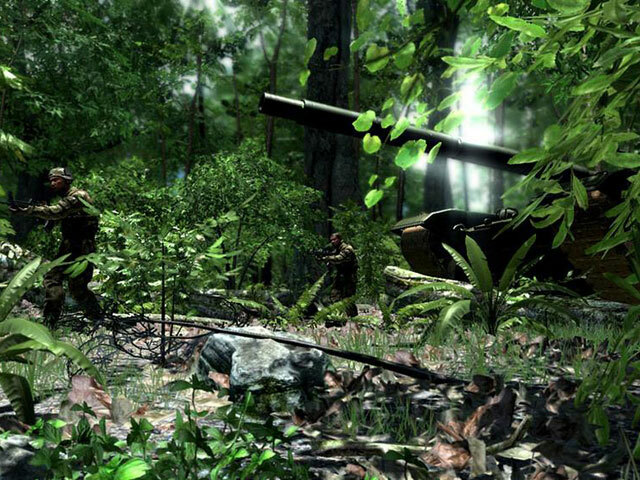 It will also expose a wide new audience to the stunningly realistic graphics, environmental physics and believable animations which are made possible by the award winning CryENGINE 2® together with some of the most recent advances in PC hardware and operating systems.”"
Here's the updated Metaverse Map with an overview of 2D and 3D virtual worlds. The large image (1024 x 1024) can be found here. The metaverse rollercoster keeps on rolling. Next week I've got to do a presentation on Second Life and the metaverse. I've been looking around a bit and decided to throw in a few logo's of Web 3D / Metaverse initiatives.